This post was created in collaboration with Black Button Distilling. This past weekend, Matt and I had the pleasure of checking out Black Button Distilling’s Buffalo tasting room for a date night cocktail class, and it did not disappoint! We had so much fun trying something new, learning about what makes Black Button special, and sipping on some delicious drinks. As a New York State Farm Distillery, Black Button crafts all of the drinks on their menu with all-natural, all-organic ingredients, 90% of which are sourced from within 45 minutes of Rochester, NY. 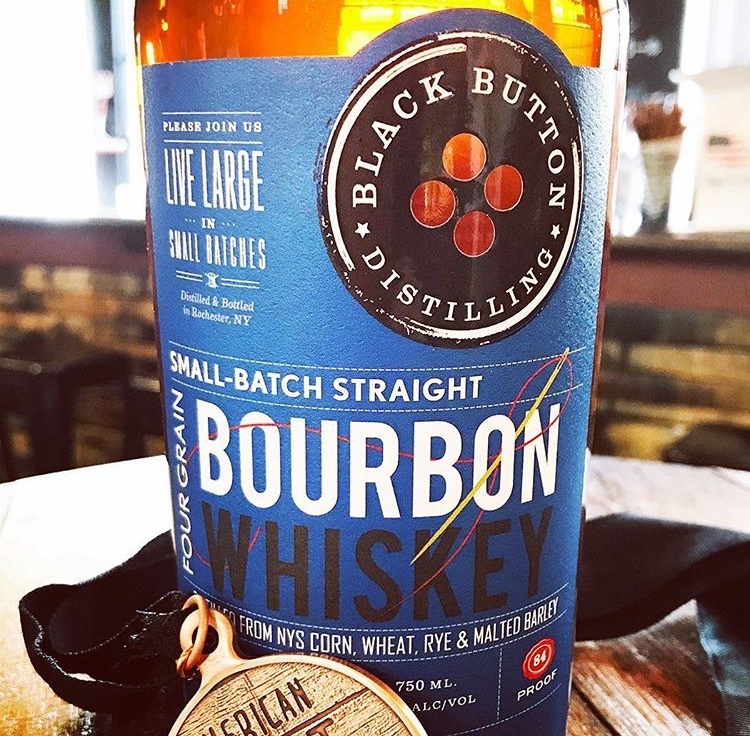 And if that wasn’t awesome enough on its own, Black Button also recently became the first distillery in the state to receive the New York Grown and Certified designation, and was also listed on the Inc. 5000 list as one of the fastest growing companies in America. Not bad for a company that’s only been around for about five years, right? -Quote from Black Button Distilling’s website. -Photo from @blackbuttondistilling on Instagram. Truth be told, Matt and I weren’t really sure what to expect from a cocktail class. We’re beer drinkers through and through, so spirits can be a little bit out of our comfort zone, but with the help of our awesome and super knowledgeable “teachers” for the night, we felt relaxed right away. We started off the night by tasting Black Button’s “fab four” spirits (pictured below): the Citrus Forward Gin, Straight Bourbon, Apple Pie Moonshine, and our personal favorite, the Bourbon Cream. Matt and I agreed that we could be completely content just drinking the Bourbon Cream straight, it’s that good. We also got the chance to taste a few of their non-alcoholic products, which included their Bourbon Bacon Ketchup, Apple Pie Moonshine BBQ Sauce, Bloody Mary mix, and Bourbon Barrel-Aged Maple Syrup, and yes, they are all as amazing as they sound. There was no way Matt and I were leaving without scooping up a couple bottles for ourselves (highly recommend the BBQ sauce). After a quick cleansing of our palettes, we moved on to try our hand at crafting one of the delicious specialty cocktails featured on their current drink menu: The Cereal Party. The drink itself is super simple: 2 ounces of Black Button’s Bourbon Cream, 1 ounce of cold brew coffee, and ½ ounce of warm, delicious nutmeg-infused simple syrup (also made in-house!). Top with cereal marshmallows and a sprinkle of nutmeg and you’re good to go! I couldn’t believe how easy it was to make this cocktail, not to mention how easy it was to drink, too. Overall, our experience at Black Button Distilling was nothing short of wonderful, and we genuinely enjoyed everything we tasted. Their Buffalo tasting room is located on Swan Street right off of the 190, and is definitely the perfect spot to hit up when you’re looking to try something new, whether it be for a cozy, romantic date night out with your boo (can’t forget that Valentine’s Day is quickly approaching! ), or even just your next girls’ night out. Thanks so much again to Black Button for inviting us out!